Hebrew: בעז ., Estonian: Boas . Also Known As: "Ufiz", "Yu'ar", "Baath", "Boaz", "בעז"
Brother of Elimelech . and Tob . He was a rich landowner who noticed Ruth, the widowed Moabite daughter-in-law of Naomi, a relative of his, gleaning grain from his fields. He soon learns of the difficult circumstances her family is in and Ruth's loyalty to Naomi. In response, Boaz invites her to eat with him and his workers regularly as well as deliberately leaving grain for her to claim while keeping a protective eye on her. Eventually, Boaz and Ruth strike up a friendship which leads to Ruth asking him to marry her. Boaz accepts, but cautions that there is a family member who has a superior right to her hand in marriage. However, he arranges a meeting with the relative and in the presence of ten town leaders convinces him to buy Naomi's husband's land. 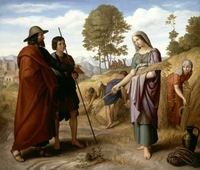 Although Boaz is noted to be much older than Ruth in the traditional account and he marries her for Naomi's sake, most dramatic adaptations have Boaz as a handsome young man so as to enhance the romantic nature of the story. Their son was Obed, father of Jesse, and grandfather of David. Born 1312 BC. A kinsman of Namo's husband, a mighty man of wealth & landowner, of the family of Elimelech. one of the sons of Magog; to whom Scythia came as his lot, upon the division of the Earth by Noah amongst his sons, and by Japhet of his part thereof amongst his sons. A well-to-do landowner of the tribe of Judah near Bethlehem, Boaz took pity on a young Moabite widow named Ruth who was working in his fields. The tender story of Boaz's kindness and Ruth's loyalty is the plot of the Book of Ruth. Boaz and Ruth married. Their son, Obed, was David's grandfather, Ruth, 1 Chronicles 2:11-12; Matthew 1:5; Luke 3:32. -- Everyone in the Bible by William P. Barker. Page: Josh. 2:1, 3; 6:17, 23, 25; Heb. 11:31; James 2:25.